Mix up a small batch of your favorite pancake batter. Grease 6 molds of a muffin pan. Put a thin layer of pancake batter at the bottom of each mold. This layer must be very thin (about 1/4 inch); thinner than when you normally make pancakes because the pancakes will rise when cooked and with the small mold, you want room for your eggs. Preheat the oven to 350F and bake the pancakes in the oven for about 3-4 minutes, until the batter is almost completely cooked. Cook strips of bacon in a pan or in the microwave until they are about half done. Line the bacon around each muffin mold. 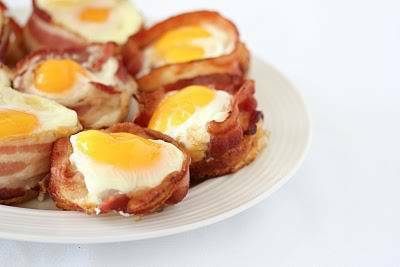 Crack an egg and pour it into the middle of each mold, inside the bacon layer. Try to take out some of the egg white, or else it will take too long for the egg white to cook and you may overcook your egg yolk. Bake at 400F for about 8 minutes or until the eggs are cooked to your desired doneness.